Enjoy healthy eating and being proud of your decision to HAVE A HEALTHY BODY and HAPPY MIND forever! To recover from bulimia you must become a normal eater. Food has to become just food. After years of bulimia this can be extremely difficult and many don’t know where to start. Food should be something that you enjoy and look forward to, not something that casts a shadow over every day of your life. Unfortunately bulimia does just that, and without treatment it can have a devastating effect. Depending on the person, the reason may be different. Low self esteem is a common cause but not always. Sometimes it just starts as a good idea that I can have my cake and eat it but then it takes over – then it can cause low self esteem as you get stuck, but whatever the reason may be you will need to recognise it and understand it to gain freedom from bulimia for the long term. Freedom from bulimia comes by working with your subconscious as it holds the answers you need to succeed. If you want to gain freedom from bulimia there may be problems that have caused it in the first place. If you are depressed, for example, then you may need professional treatment to help you overcome depression as well as to get freedom from bulimia. You need to learn how to handle your emotions rather than stuff the feelings down with food. Self hypnosis is an ideal way to help with freedom from bulimia as it works with your subconscious to give you the freedom from bulimia you need. The first step towards gaining freedom from bulimia is often the hardest, but it sets you firmly on the road to a brighter future where you can enjoy food just as other people do. It won’t be your enemy any more! 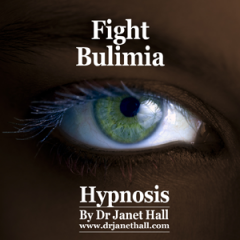 Dr Jan’s recording of “Fight Bulimia” will give you the bulimia help you need to turn your life around. How to establish a pattern of regular meals and snacks while learning strategies to curb urges to overeat. How to eliminate binge urges and cravings by restoring your body’s own natural food regulation system. How to get back in touch with subtle feelings of hunger and satiety to help guide you to relearn what, when and how much you should eat. How to overcome unhelpful negative thoughts and uncomfortable emotions. How to effectively deal with relapses and setbacks. How to stay at your natural healthy weight for life, while eating whatever you want.